Need ideas or help making your vision into reality? Read how our dedicated exhibit designers can create the perfect exhibit design for your next marketing venue. Do you own a business? If so, you’ll need to find a few different ways to market your services. While most marketing efforts these days are focused on the Internet (and those marketing tactics are great), you have to bring your product or service offline too. Some people just aren’t connected to devices and the Internet all the time (or at all), and that means that you’ll be missing out on a whole demographic if you skip offline marketing. One of the best ways to market offline is with an exhibit booth. Exhibition booths are easy to set up, display, and can be brought or shipped to any convention center. From there, you can engage with customers in a face-to-face atmosphere, demonstrate what it is that you are selling, and really interact with your market. But, first, you’ll have to pick the right kind of exhibit booth design. Where do you begin? Creating an exhibit booth design is kind of like figuring out where things go on a website or brochure. You may have a few great ideas for designs, but understanding where to place those ideas (or how to execute them) is another story (one that’s not so easy to create!). Booth design isn’t left up to chance, either. There’s a lot of artistic talent and market testing that goes into creating the perfect design. Colors, for example, can evoke certain feelings. Choosing the wrong color or putting a color in the wrong spot can actually turn away your market. So, how can you incorporate your design ideas into a customized display booth? 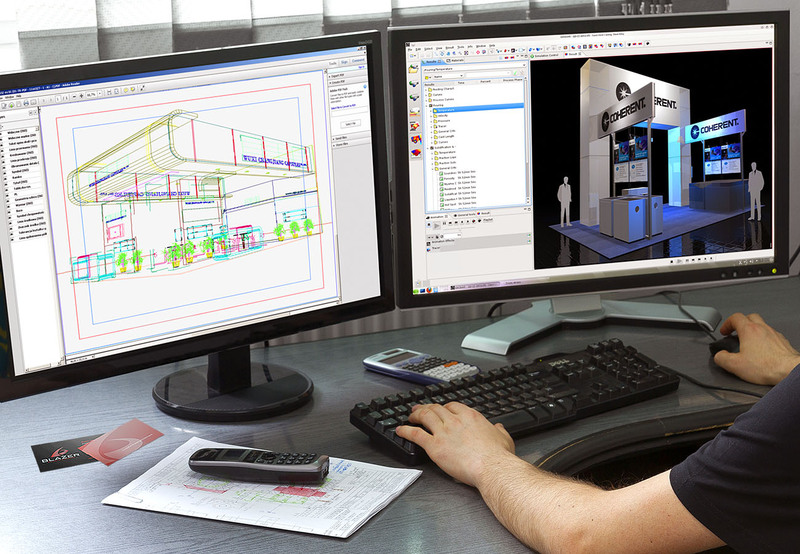 One way to get the job done is to work with a professional exhibition booth design team. Companies that develop and design displays can provide you with graphic design guidance in addition to structural advice (not all booths look or act the same). Deciding to hire professionals to craft the perfect display for your product is a really wise choice. After you’ve made the decision to invest in a professional team, you’ll have to find one that works well with you and your company (which may include a designer or two). Teams that have been in business for more than a few years are your best bet. These professionals can provide you with display booth examples, ideas, and samples. It’s also important to work with a company that understands your market and your vision. You wouldn’t partner up with someone that refuses to listen to your requests, right? So, don’t work with a booth design team that can’t incorporate your ideas. Customized exhibit displays stand out far more than displays that are generic, so keep this in mind. 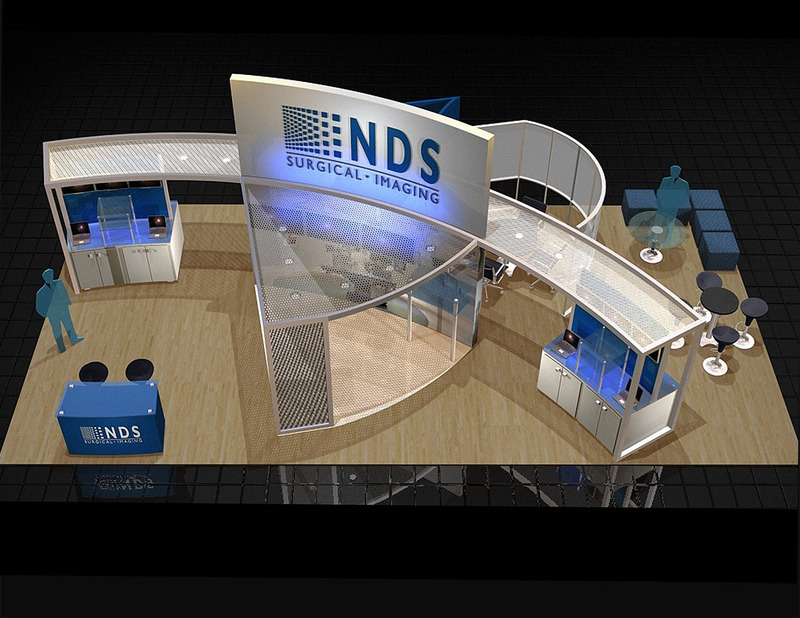 Find an exhibition booth team that can customize any display to your specific needs. That said, a bit of understanding into the way that these displays are made certainly helps. There are various types of exhibit displays including inline, island, and portable displays (the most popular options). Inline displays includes booths on both sides of your main area, and a booth in the back of your area (or sometimes just the back booth). Portable displays are made for travel ease, and are often light enough to pack up and carry anywhere that you go. Since you may have to travel to a few different conventions in order to effectively market, a portable display is a good idea. The other type of display, island displays, are eye-catching, and include an island-type setup (like you would have in your kitchen), so that every side of the display is open to public traffic. It can be tough to choose the right kind of display on your own, and that’s where an exhibition booth company that has years of experience comes into play. Ask the company that you work with to view different display types, samples, and photographs of previously crafted booths. You should also consider the product or service that you are selling, and what you will need your market to do when you set up your booth (do you want people to approach on all sides or just on one side, etc.). In the end, attending conferences in order to market your company in-person is a really good addition to your overall marketing plan. Plus, you’ll find that there are conferences and events for almost every type of business. Start researching the best place to set up your trade show exhibit booth today, and you’ll quickly see why this kind of marketing has been so popular for so long! Just remember to pick the right display, work with the right exhibit team, and develop a booth that draws people in while also showcasing what you do best. Take a look around the rest of the articles on this site to view more information about specific types of display booths.